Whether you’re doing a whole scale renovation or just a mini makeover, adding new curtains to a room can make all the difference. But sometimes you want a window treatment that is clean lined, doesn’t take up too much space around the window and doesn’t cost too much to make. 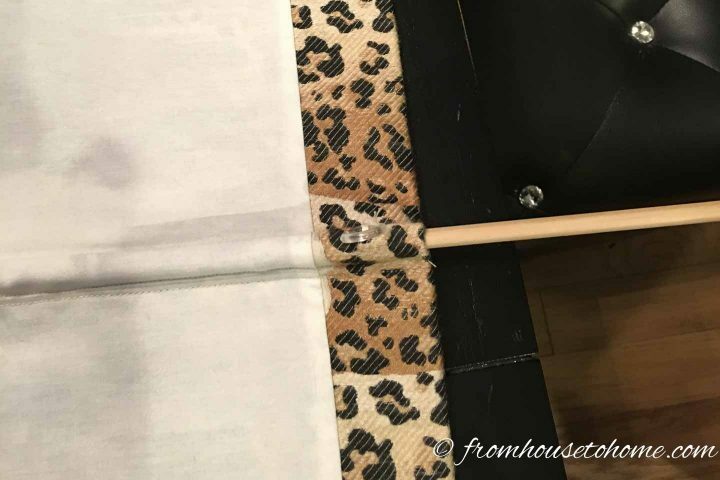 Learning how to make roman shades (with or without dowels) may be just the solution you’re looking for! 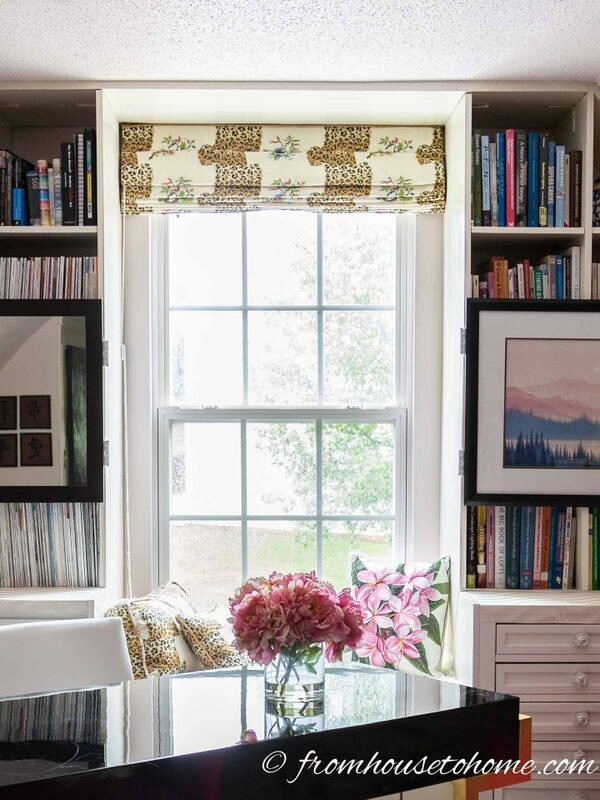 The best solution to decorating a small window to let the maximum amount of light into the room is often a very simple treatment like a Roman shade. This type of window shade doesn’t take up much space around the window (especially if you install it inside the window frame), but still allows you to have a window treatment that coordinates with the room décor. Although it looks complicated (and can be quite expensive to buy), a roman shade really isn’t that difficult to make on your own. It’s basically a straight piece of fabric that opens by a pulley system into flat folds at the top of the window. Don’t be deterred by all of the little details involved. Once you get the idea, it isn’t hard. Can I Make Roman Shades Without Dowels? I have made roman shades with dowels and without dowels. Using dowels helps to make the sections of the shade fold more neatly when you pull the shade up. But they require a little more effort and a few more supplies to make. Making roman shades without dowels is a little easier but you may need to arrange the folds so they lay flat. 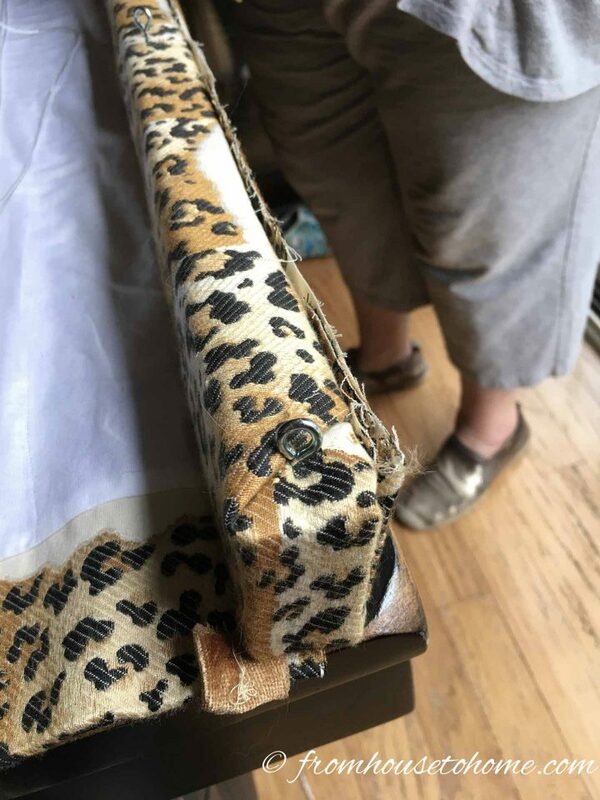 My rule of thumb is: If the roman shade is in a location where it tends to stay open (or closed) most of the time, I’ll make it without the dowels. If the position of the shade will change often, the dowels make it easier to use. How Do You Measure A Window For Roman Shades? There are two ways that you can install a Roman shade. The first is so that it fits completely inside the window frame, which doesn’t take up any additional wall space at all. The second is outside the window frame, so that the frame and part of the wall is covered by the shade. Before you can measure for your window treatments, you need to decide which of these two options you’re going to use. To do this, you need to take accurate window measurements to make sure that the blind is not going to be too small or too large. 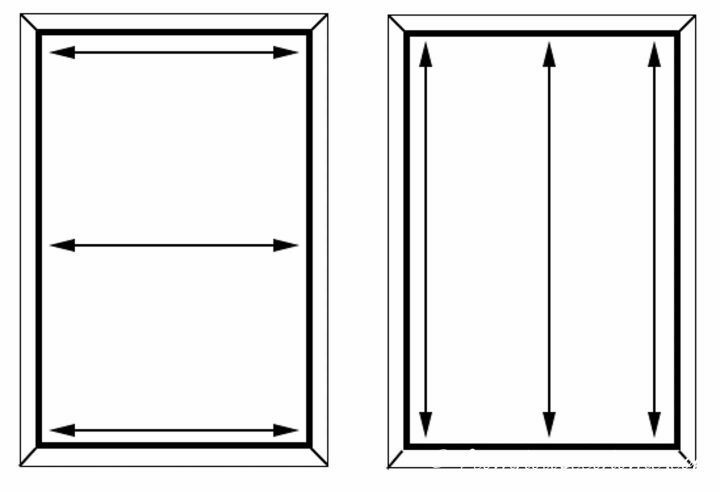 To get the width of the window, measure from the inside edge on the left side of the window frame to the inside edge on the right side of the window frame. Take the SMALLEST of those three measurements as the width. Then subtract 1/8″. This is the finished width of your shade. Note: If your window frame is really out of square and there is a big difference between your measurements, you may want to consider doing an outside the window frame installation. Otherwise, you will likely be able to see that the shade does not fit properly in some parts of the window. Next, you’ll need to measure the height of your window. Start from the inside edge at the top of the frame and measure down to the window sill at the bottom of the frame. If you don’t have a window sill, measure down to the inside edge at the bottom of the frame. Repeat this 3 times – once at the left side of the frame, once in the center of the frame and once at the right side of the frame. Take the LARGEST of those three measurements as the height. This is the finished length of your shade. Note: If you are making multiple shades for the same room, you’ll want to make them all the same length as the largest measurement across all the windows. That way the folds will all be even across them. When you are installing the shade outside of your window frame, you have a little more leeway since the blind doesn’t have to fit exactly inside the frame. To get the width of the window, measure from the outside edge on the left side of the window frame to the outside edge on the right side of the window frame. Take the LARGEST of those three measurements as the width. Then add at least 4″ (so that the blind will overlap the frame by 2″ on either side). You can make it larger than this if you wish to make the blind wider than the window. This is the finished width of your shade. Start from the outside edge at the top of the frame and measure down to the window sill. If you don’t have a window sill, measure down to the inside edge of the bottom of the frame. Take the LARGEST of those three measurements as the length. Then add at least 2″. If you wish to make the blind taller than the window, you can add more than this to increase the height. This is the finished length of your shade. How Much Fabric Do You Need For Roman Shades? 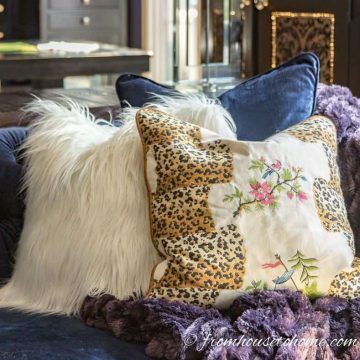 Add 4″ to the width that you want the shade to be (from the measurements above). 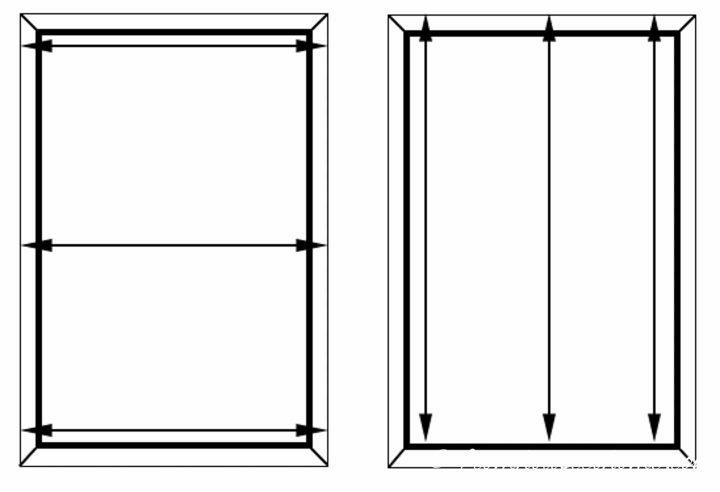 For example, if your window width measurement is 36″, your fabric will need to be 36″ + 4″ = 40″ wide. Next you’ll need to calculate the length, which depends on the number of dowels you’ll be using. Each dowel adds an additional 1 1/2″ of fabric. I usually plan to have a dowel every 8 inches and don’t worry too much if the top section is a little longer or shorter than the rest. Which means dividing the window length by 9 1/2″ to find out how many dowels are required. Then round the result to the closest whole number. 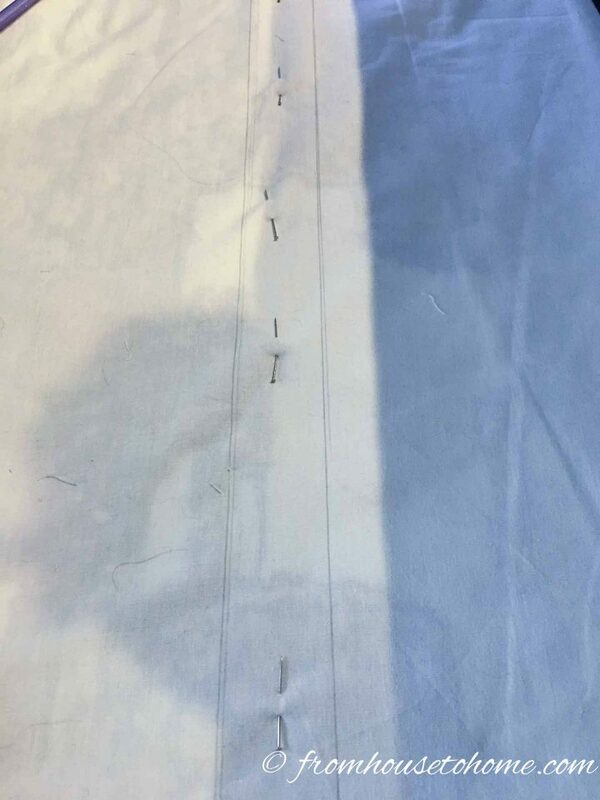 Then calculate the fabric length: Desired height (from the measurements above) + (1 1/2″ x number the dowels) + 4″. Total amount of fabric required: 68″ + (1 1/2″ x 7) + 4″ = 82 1/2″. If you aren’t using dowels for your roman shades, add 4″ to the length that you want your shade to be (from the measurements above). For example, if your window length is 78 1/2″, your fabric length will be 78 1/2″ + 4″ = 82 1/2″. 1. 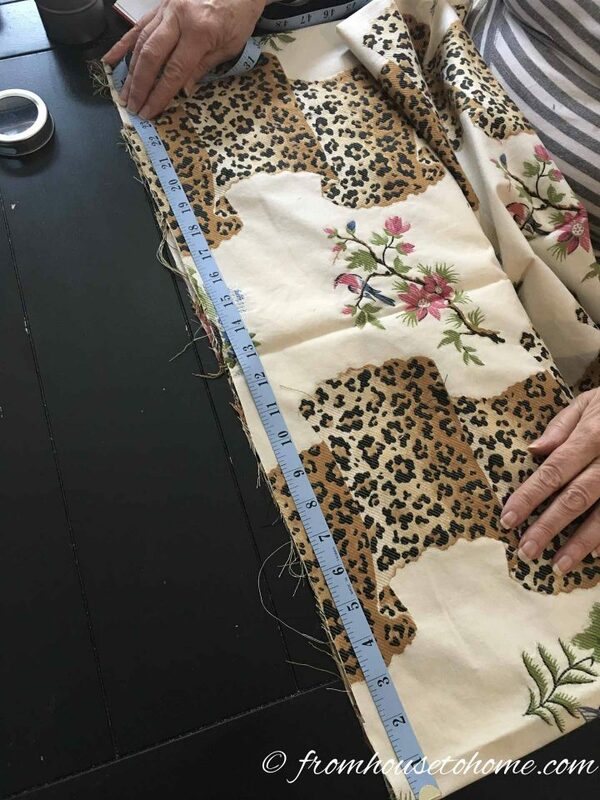 For the width of the lining, subtract 2″ from the fabric width you calculated above. 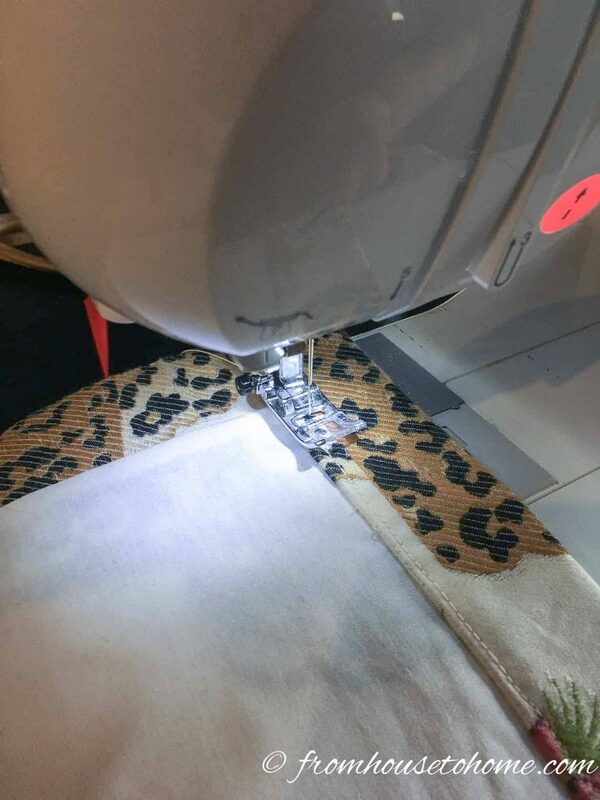 In our example, the fabric width is 40″ wide so the lining width will be 40″ – 2″ = 38″ wide. 2. 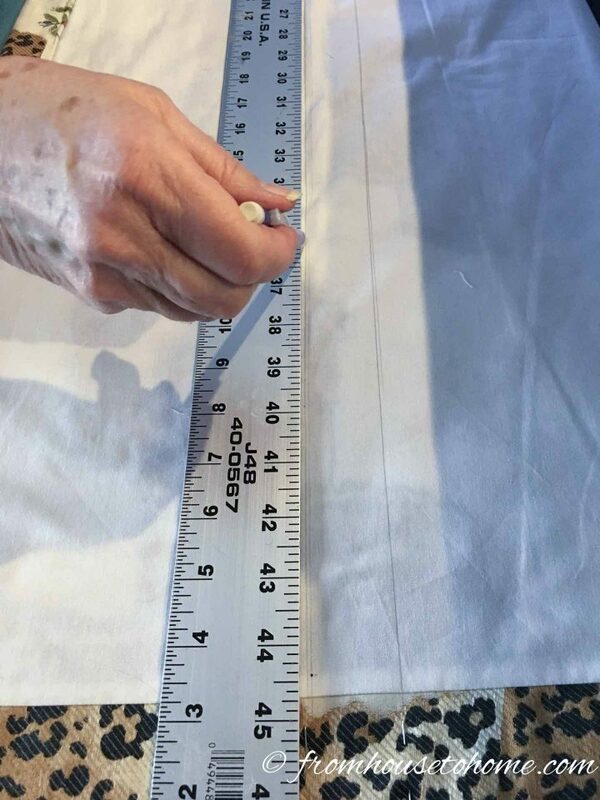 To calculate the length of the lining, subtract 1″ from the fabric length you calculated above. 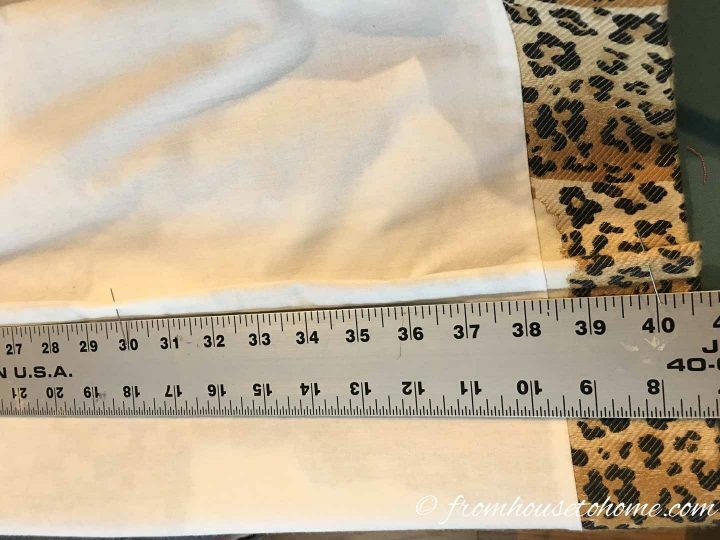 In our example, the fabric length is 82 1/2″ so the lining length will be 82 1/2″ – 1″ = 81 1/2″. Measure and cut the fabric and lining as calculated. 1. 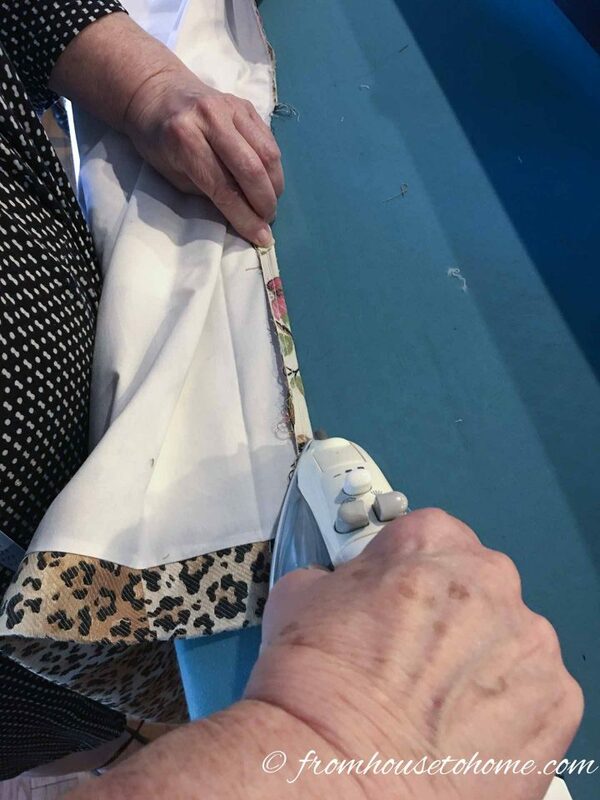 With the right sides of the fabric and lining together (facing towards each other), line up the top edges so that they are even. Make sure that the pattern of the fabric will be hanging the right way when the curtain is hung. 2. 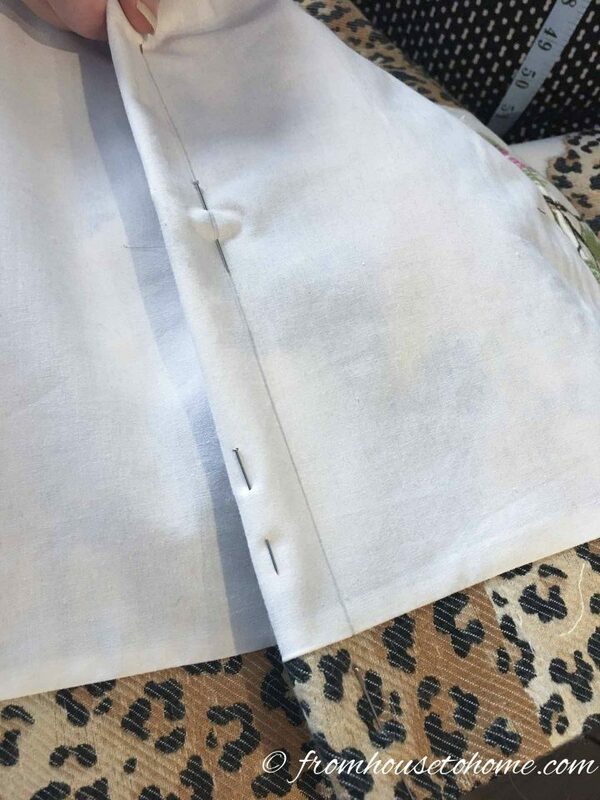 Sew the fabric and lining at the sides. 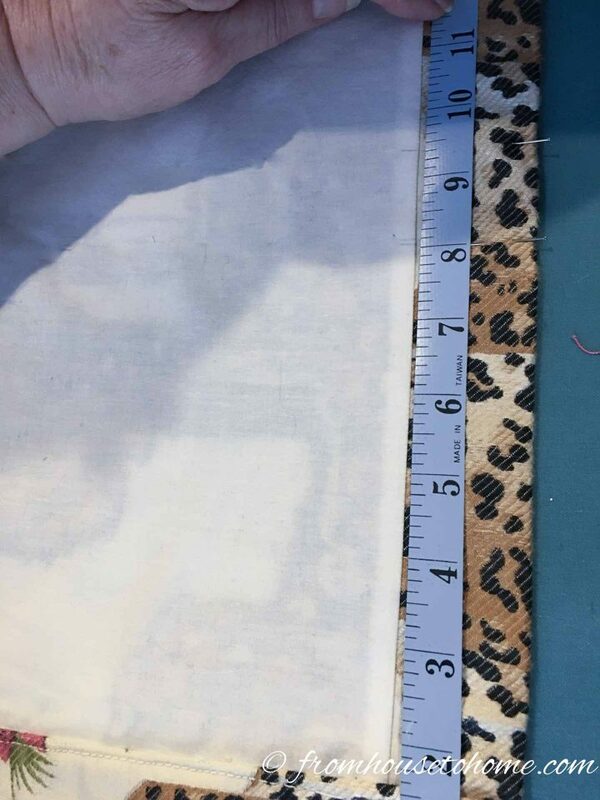 Note that the fabric will be 1″ longer than the lining at the bottom. 3. Turn the fabric and lining so that the right sides facing out. 4. Lay out the fabric with the lining side up. 5. Center the lining over the fabric so that there is an equal amount of fabric showing on each edge. 6. Use the iron to press the edges flat. 1. 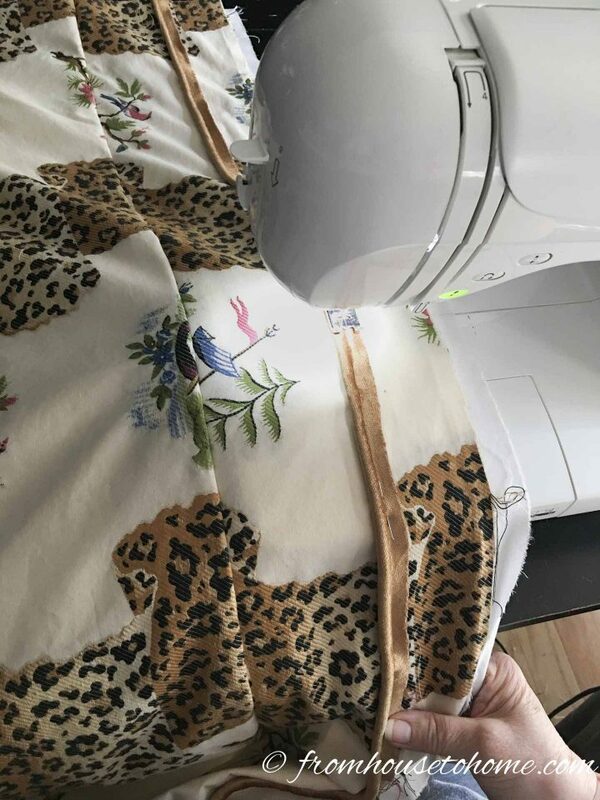 Fold the fabric at the bottom of the curtain towards the back 2 inches so that it covers the bottom of the lining. 2. Press the fold flat with the iron. 3. Open the folded fabric you just ironed. 4. Fold the raw edge of the fabric over 1/2 “. 5. 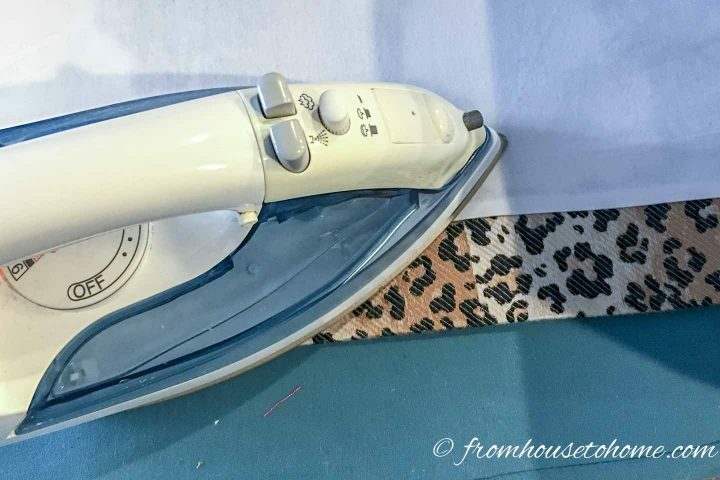 Press the fold flat with the iron. 6. Stitch all the way across the shade close to the edge of the fabric at the top of the fold. This will create a tube that the bottom dowel will fit in, so make sure to leave the ends of the tube open. If you are making roman shades without dowels, you can skip this step and go on to the next one. 1. 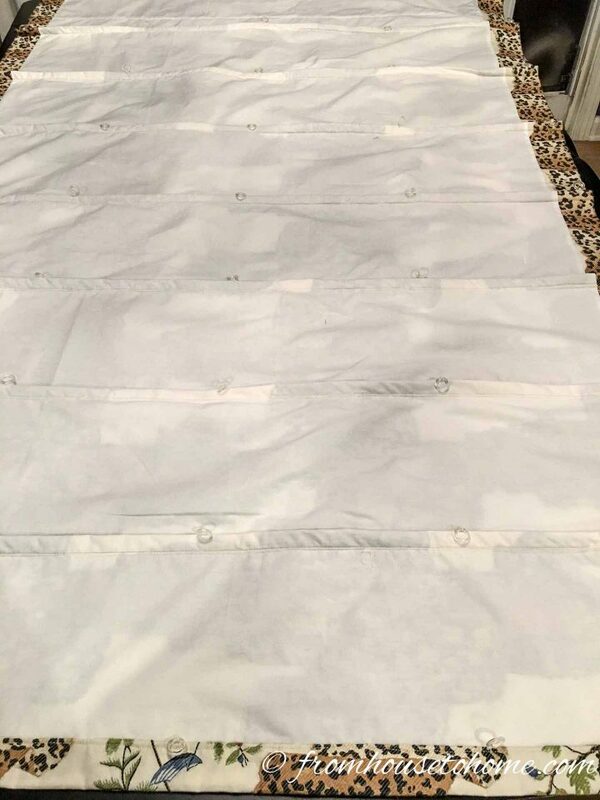 Lay the fabric out on a flat surface with the lining side facing up. 2. Measure 8″ up from the bottom at each side edge. 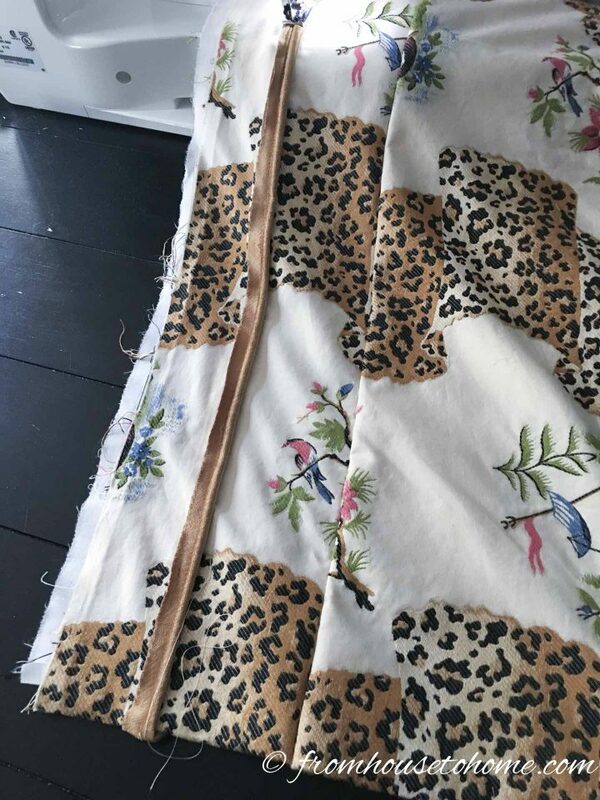 Draw a pencil line between these two places along the entire width of the fabric using a yard stick. 3. Measure 9 1/2″ up from the bottom at each side edge. Draw a pencil line between these two places along the entire width of the fabric using a yard stick. 4. Pin the lining and fabric together randomly in between these two lines to hold the 2 fabrics in place. 5. Now, with right sides of the fabric facing each other, fold the shade so that the two lines meet. 6. 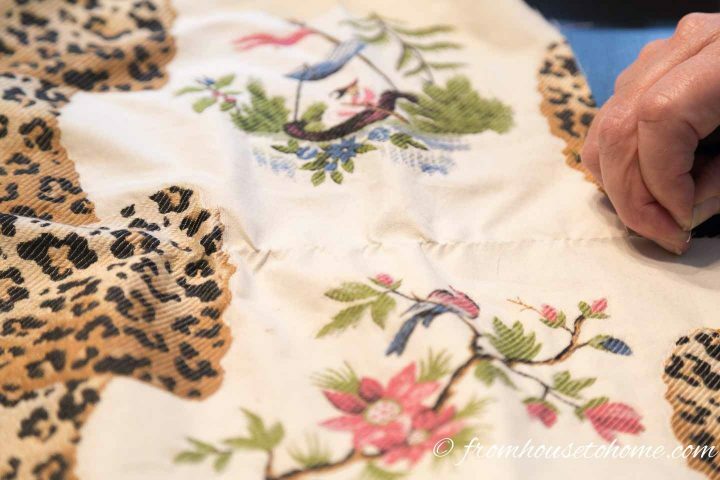 Pin all the way across fabric along the lines. 7. Sew along the line so that you have created a tube that the dowel will fit in. 8. 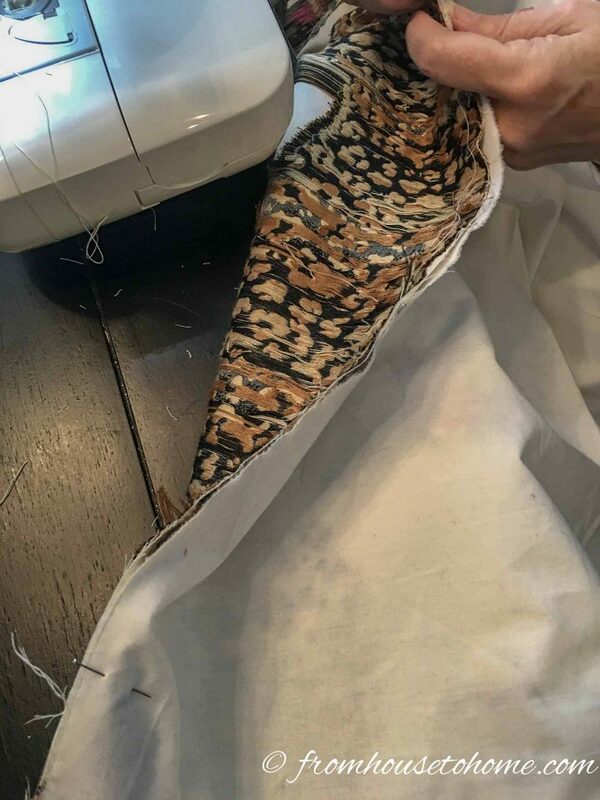 Repeat this process by measuring 8″ up (and then 9 1/2″ up) from the newly sewn line. Pin and sew as described. Continue until you are approximately 10″ from the top. For a finished professional look, you can add piping to the top of the shade where it will be attached to the mounting board. 1. 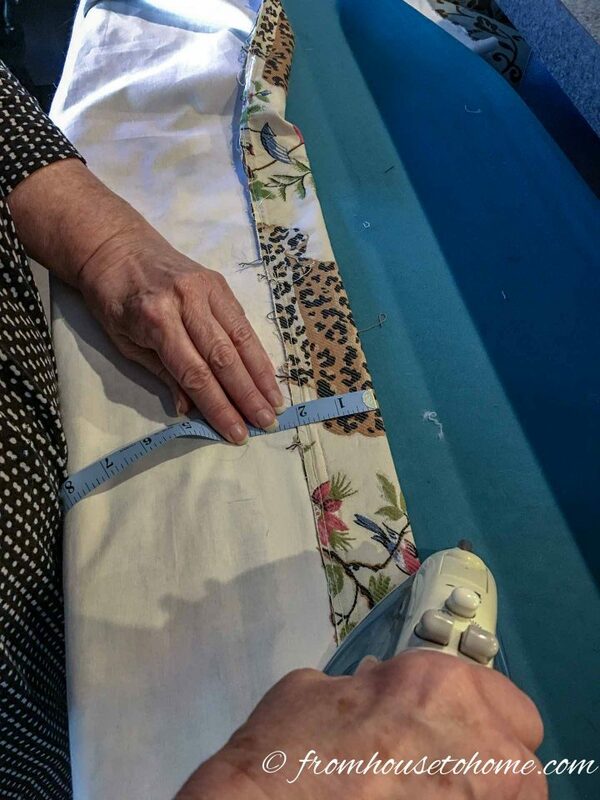 To do this, measure up from the bottom of the roman shade to your desired finished length of the shade. 2. 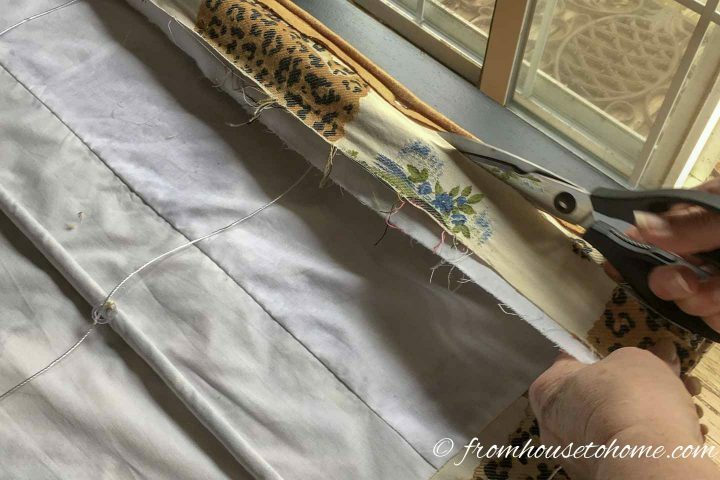 Sew piping across the width of the fabric with the unfinished piping edges pointed up towards the top of the roman shade. 1. 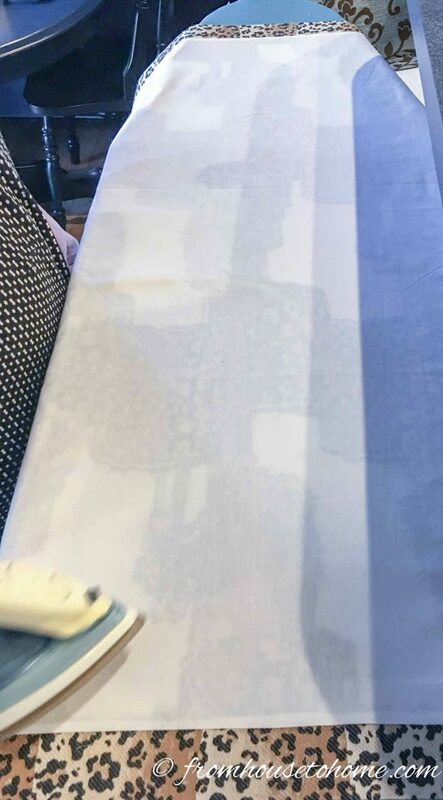 Lay the shade on a flat surface with the lining facing up. 2. Figure out how far apart the rings should be. There should be one ring placed about 1″ in from each side of the shade. Then additional rings should placed about 10″ apart across the width of the shade. 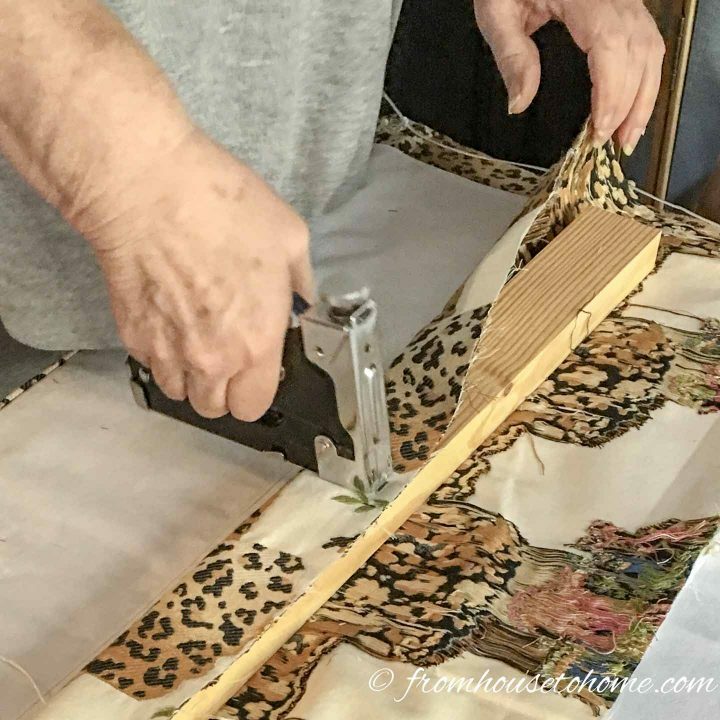 The shade will work best if the rings are placed an equal distant apart so you may have to adjust the 10″ spacing slightly to work with the width of your roman shade. 2. 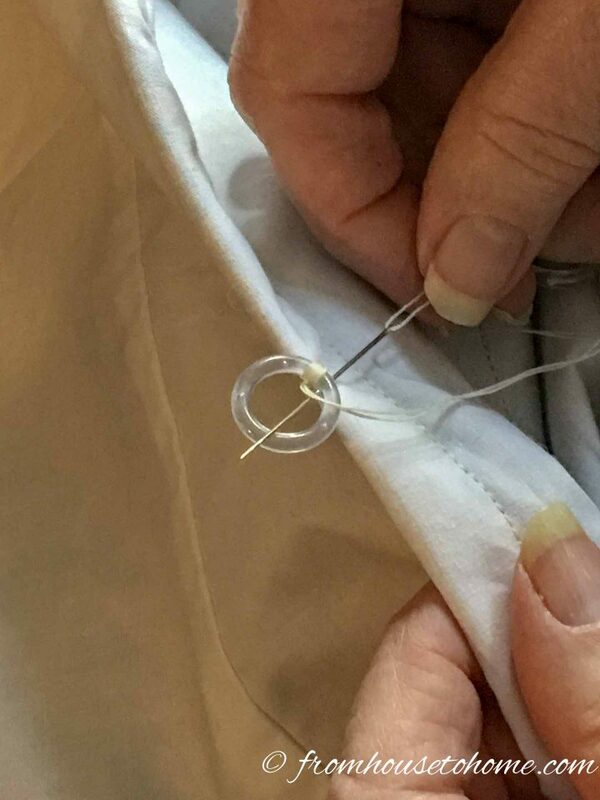 Use a sewing needle to attach the rings. 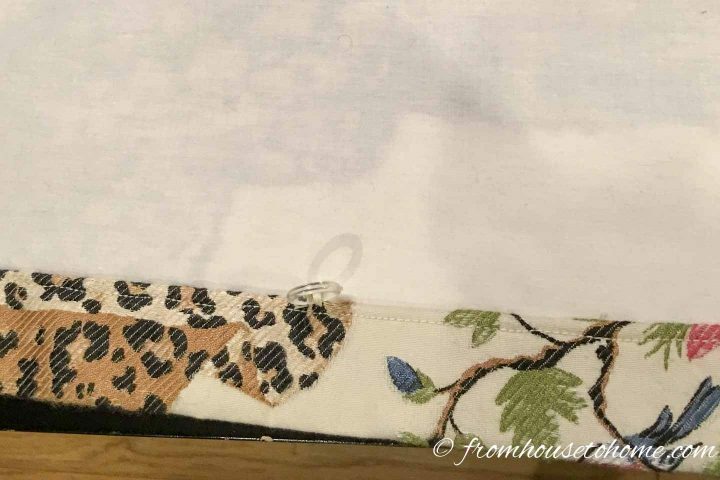 The first one should be about 1″ in from the edge of the fabric at the bottom seam line. 3. 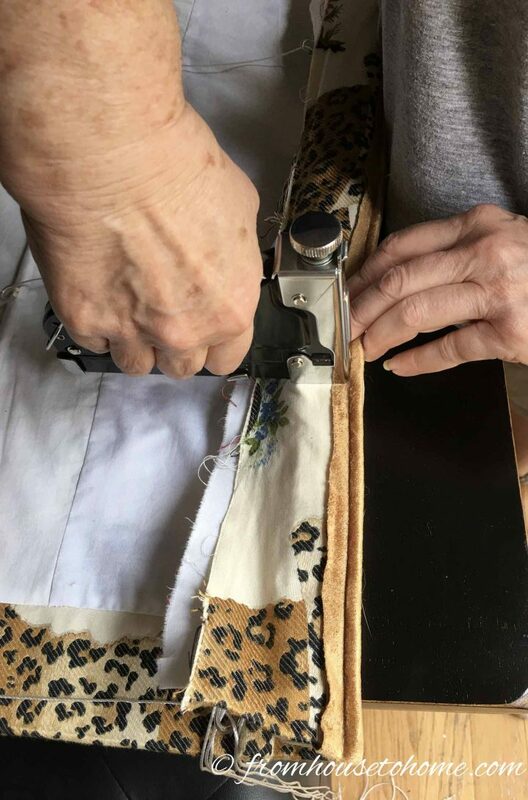 Continue along the bottom seam line, sewing on additional rings about 10″ apart (using whatever spacing you decided on above). 4. 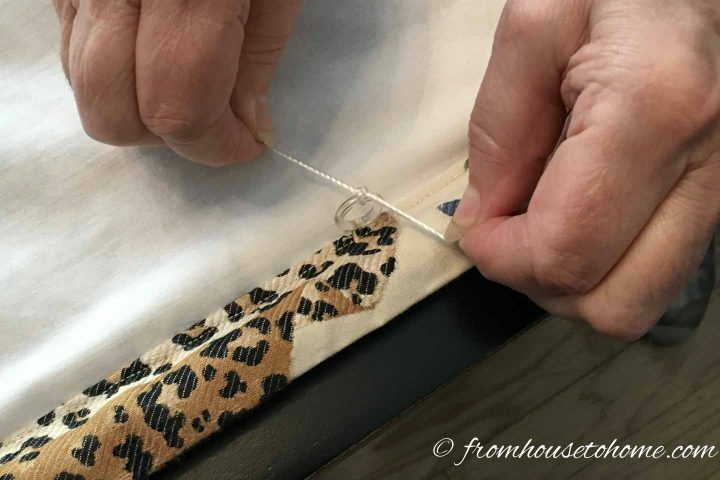 Sew the last ring on the bottom seam line about 1″ in from the other side. 5. Using a pencil, draw a line from each of the rings in the bottom seam to the top of the shade. Make sure the line is straight up and down or your shade won’t open evenly. If you used dowels, the rings will be placed along the back edge of the dowel folds. If you did not use dowels, you’ll need to draw lines across the width of the fabric using a pencil. The lines should be 8″ apart starting from the bottom of the shade. 7. Insert the 1/2″ dowel into the bottom gusset, and the 1/4″ dowels (if you are using them) into the other gussets. 1. Cut the 1″ x 2″ board so that it is the same length as the finished width of your roman shade. 2. Wrap the board with left over fabric and staple it onto the back of the board. 3. Securely staple the unfinished top of the curtain to the 2″ side of the board. If you used piping, make sure that it is lined up with the top edge of the board. 4. Trim off any extra fabric on the board behind the staples. 5. Screw small eye hooks into the board so that they match the spacing of the rings on the shade. It is easier to get the eye hooks into the board if you pre-drill the hole with a small drill bit. The shade should now fall straight down with the piping at the top when the board is held up. 1. Cut the cord into pieces. 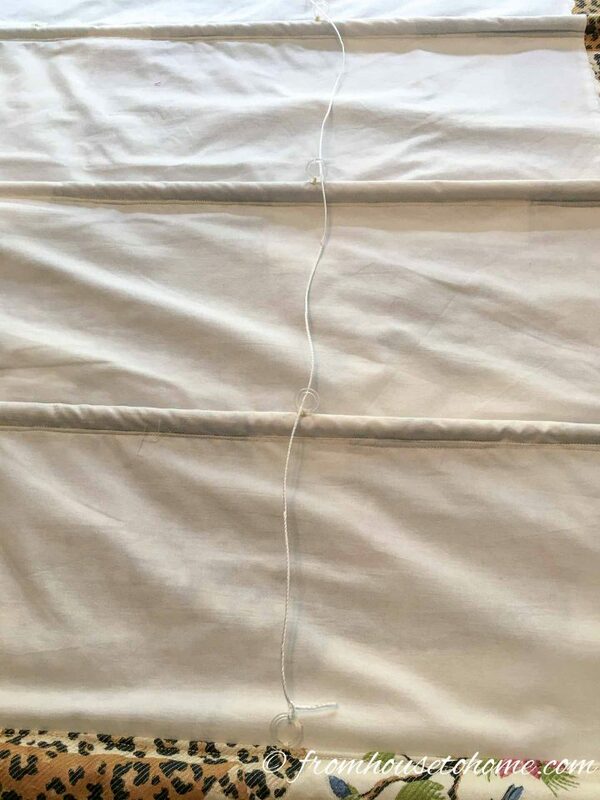 To determine the length of the cords, add the finished width to the finished length plus 60 inches. 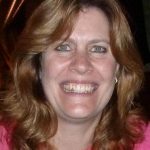 For example, if the finished width is 36″ and the finished length is 78″, you cord will need to be 36″ + 78″ + 60″ = 174″ long. 2. Tie a cord securely to each of the bottom rings. 3. String the cords individually through the rings so that each one goes straight up to the top of the roman shade, and through the matching eye screw on the mounting board. 4. Then thread all of the cords through the eye hooks on the mounting board so that the ends are all on one side of the board. i.e. Cord 1 goes through eye hook 1 only. Cord 2 goes though eye hooks 2 and then 1. Cord 3 goes through eye hooks 3, then 2 and 1. Cord 4 goes through eye hook 4, then 3, then 2 and 1 etc. For an inside the window frame mount, use screws to attach the mounting board (and the shade) under the top of the window frame so that the piping is along the edge of the frame. For an outside the window frame mount, attach 1 1/2″ corner braces to the wall. 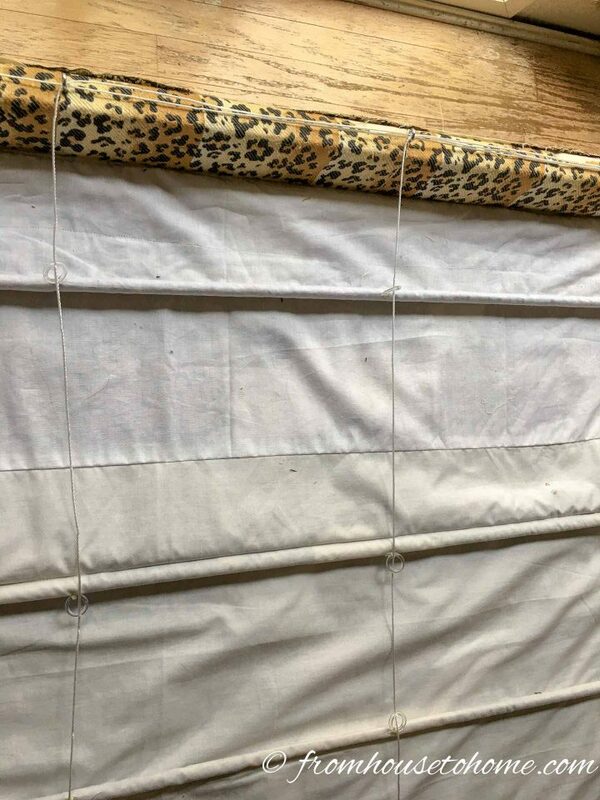 The bracket should be installed so that the top of it (the part that is sticking out) is 3/4″ below the desired curtain height. If you are covering a wide window, you’ll need to install one or two extra brackets in the middle to prevent the mounting board from sagging. 2. 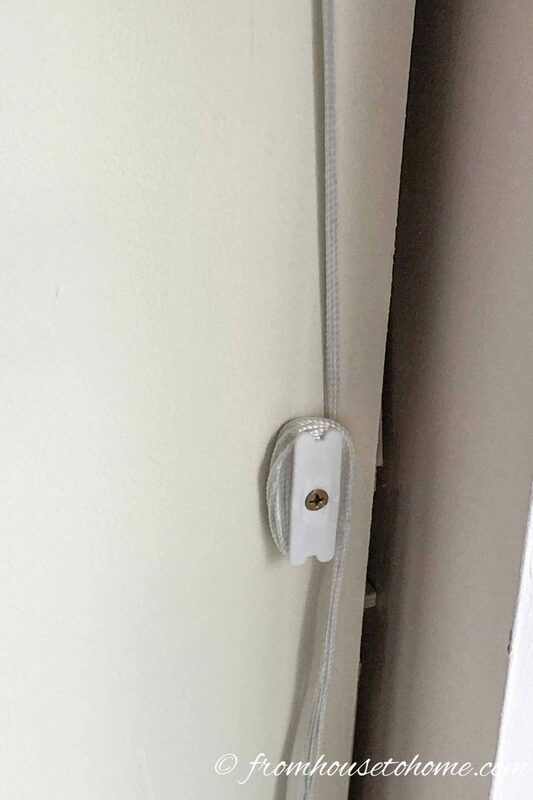 Add one additional eye hook in the wall close to the mounting board. 3. Pull all of the cords through this. 4. 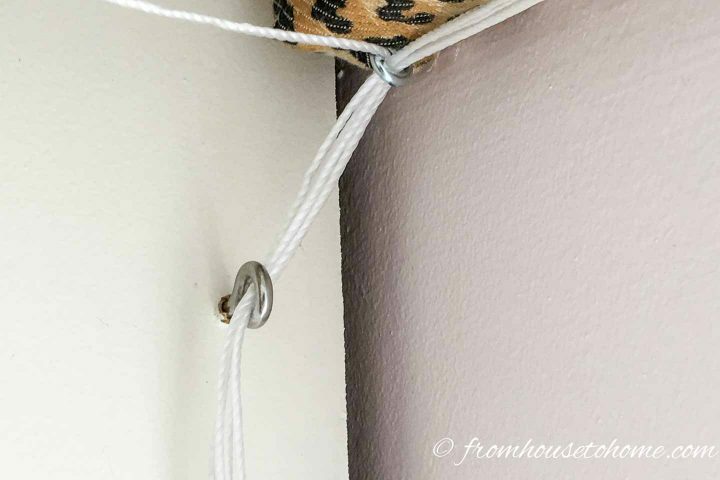 Attach a cleat below this at a convenient height for winding the cords around when the shade is open. 5. Cut off any excess cord. Note: If you have young children in your home, for safety reasons, you may want to make sure the cords are in a location that they cannot reach. Well, you made it to the end. 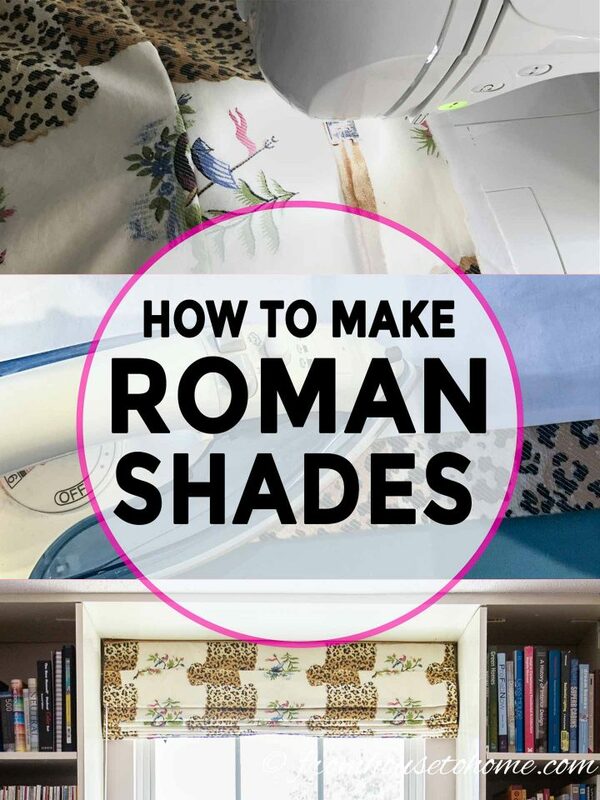 Hopefully, you were able to make yourself some homemade roman shades that go with your decor! Have comments of questions on how to make roman shades? Tell us in the section below.